Breckenridge Brewing’s Vanilla Porter has been one of my guilty pleasures for years. I seek it out during the lean, winter months when I can’t get ahold of some of the more robust seasonal brews. With notes of cinnamon and beaucoup vanilla, it’s a hell of a stand in, and it’s available year round at my grocery store. So I was more than a little curious when Breckenridge Brewing announced at the end of last year that they’ll be releasing a canned nitro version of the beer. Not everybody appreciates this recent boom of nitrogenated beers. The argument against nitro beers basically goes like this: without the carbonation, the beer tastes flat. And what’s worse, the nitro gas can even mask some of the more flavorful characteristics of certain beers, particularly IPAs. Not too long ago, we gave one nitro IPA what might be the lowest rating ever at the magazine. Personally, I dig the nitro. Not all the time and not for every beer, but for some stouts and porters, yeah, I think it works. There’s a Scotch ale that I simply cannot bring myself to drink, I think it so foul. Except when it’s given the nitro treatment, because on nitro, this Scotch ale turns into a smooth, caramel vixen that I can’t get enough of. After drinking Breck’s Nitro Vanilla Porter side by side with their regular Vanilla Porter, I can honestly say that I don’t know which one I like better. One thing’s for certain, they’re two completely different beers. As with all nitro beers, it’s fun to watch the reverse cascading affect after the pour, as the bubbles defy gravity and slowly churn their way to the top of the nitro porter. The head on the nitro version sticks around forever, lasting essentially until the last sip. Beyond the visuals, the nitro does what nitro is famous for doing: It creates a creamy, soft mouthfeel, like your drinking the silky edges of a baby’s blanket. It’s a cool trick. But the gas can also even out the edges and smooth things out a bit too much. 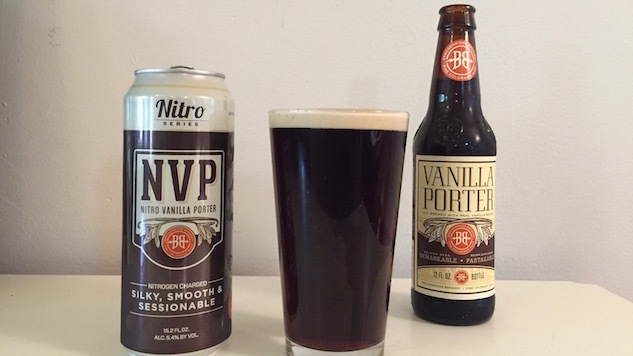 While vanilla dominates the regular porter, it’s faint in the nitro version. And while the regular porter has a sharp, almost crisp mouthfeel with a dry finish and a roasted bitterness that lingers, the nitro version comes across as a little thin to the point of feeling watered down, and the beer disappears completely after the sip. The gas also cuts through some of the sweetness, which is probably a good thing. Think of the canned nitro as a mellow, more subtle version of Vanilla Porter that’s incredibly easy to drink. The nitro takes Vanilla Porter from the realm of guilty pleasure to a session beer—something I could see myself knocking back one after the other. Which version do I like best? It depends on the mood I’m in at the time. Sometimes, I want a creamy session beer. Sometimes I’m looking for dessert in a glass.